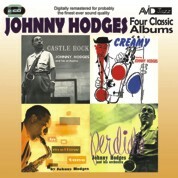 AVID Jazz here presents four classic Johnny Hodges albums, including original LP liner notes on a finely re-mastered and low priced double CD. Castle Rock, In A Mellow Tone, Perdido and Creamy. For all those who may have thought the cool, rather forbidding sax player alongside the legendary Duke Ellington was just a side man, AVIDs latest Four Classic Albums release showcases Johnny Hodges in his own right. Beginning with Castle Rock a track written by Ellington sideman Al Sears we hear both sides of the Hodges style, both mellow and hard hitting! Hodges is joined by many Ellington alumni across our four classic albums and indeed as we will discover the Duke and his legendary writing partner Billy Strayhorn are featured writers on many tracks. However it is Rabbit who we can really focus on while we enjoy these fine solo albums.